Join the teaching revolution that's sweeping the U.S. ... and the world! 150,000 registered members of WholeBrainTeaching.com worldwide: 5,000,000 YouTube views: 15,000,000 pages of free ebooks downloaded from WholeBrainTeaching.com, one of the world's largest, free, education websites! If your rambunctious kids are driving you batty, read this book. Guffaw with delight as your class, guided by the Guff Counter, halts back talking students in their tracks! Weep with joy at the power of the Independents that turns rebel cliques against each other. Gasp in awe as you discover Mirror, the simple technique that makes every lesson magnetically engaging. Chortle with merriment as the magical Scoreboard transforms classroom management into a living video game. Whole Brain Teaching, a grass roots, education reform movement, begun in 1999 by three Southern California teachers, has attracted an astonishing following among educators across the U.S. and in 30 foreign countries. Based on cutting edge scientific research, Whole Brain Teaching recognizes that students learn the most when they are engaged in lessons that involve seeing, hearing, doing, speaking and feeling. Join the revolution! Transform your students from passive receivers of information to dynamic creators of high energy lessons. "In my 38 years in education, I have never seen a more successful classroom management system than Whole Brain Teaching. It's simple, effective and powerful. 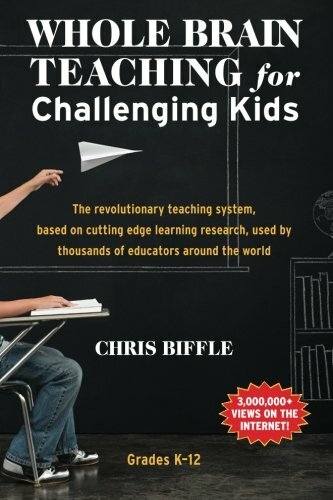 Chris Biffle and his colleagues have developed a strategy that works for all students."